Silent app installation is a feature that could only be enabled in the supervised mode in iOS devices. A supervised device which is also enrolled in an MDM makes it easy for the admin to push apps to the devices silently. The advantage of this feature is that it does not require any user interaction while installing the app. The app just shows up on the device without any prompts. The reason this feature works only in supervised mode is because Apple does not allow installing apps to a device without the permission of the user unless the device is managed by the enterprise. The apps can be free, purchased or enterprise apps. They may be purchased through Volume Purchase Program or not. The apps purchased through VPP behave differently with respect to other apps when pushed to the devices. Here we are addressing the behaviour of apps purchased through VPP and without VPP in the silent app installation. When using redemption codes the users will have to sign in with their Apple id and redeem the codes themselves. Once assigned, the apps cannot be reassigned. Silent app installation comes to play in the managed distribution method. Managed distribution enables assigning apps specifically to users or devices silently with the help of an MDM. Managed distribution works only in iOS 7 or later. While assigning apps to users, first they have to be invited to the Managed distribution program and they will need an Apple id for participating in the managed distribution. The Apple id may be specific for all users or common to all users. After that they won’t need to enter the Apple id anymore for installing the apps since the Apple id is already linked with the VPP program. So if the users are enrolled in an MDM the app will appear as installed in the user’s device as soon as the admin pushes the app. If no MDM is used the users can install the app directly from Purchases themselves. Since the apps are linked with the Apple id it can be reassigned to other Apple id if necessary and also the apps can be used in all devices associated with the same user. This feature is available in iOS 7 or later. While assigning apps to devices no Apple id or invitation to the VPP program is needed whatsoever. Since apps are assigned to devices they cannot be installed from Purchases so they need an MDM or Apple configurator for installing the apps. The apps can be reassigned to other devices or users if necessary. Anyone who uses the device can access the apps. This feature is available in iOS 9 or later. It is possible to silently install apps which are not purchased through VPP. First, you have to configure iTunes in the device (assuming the device is already supervised): When pushing an app from store to devices without VPP the device will ask the user to login to the iTunes account with an Apple id and password. If the user is already logged in to the apple account the app will install silently. This is only in the case of app store apps. In the case of free apps, there is an option in device settings to install free apps without requiring the Apple id (Settings – General – Restrictions – Password settings – Free downloads – Require password). For enterprise apps no Apple id is required, the app will install silently as soon as it is pushed to the device. First select the device (or devices) on which the app is to be installed. Select Install Application in the Manage tab. Select the app you want to install from the local apps or public store. Now the app will be installed in the device (or devices) to which it was assigned to. Disable the “Force user to enter iTunes store password for all purchase” in Hexnode MDM. There should not be any content restrictions. 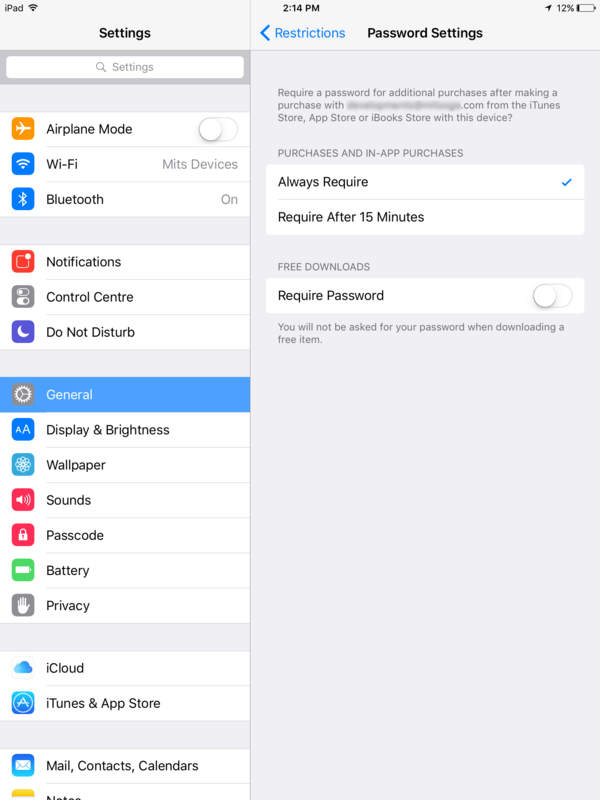 Enable “Allow use of iTunes store”. Once these settings are in place the apps will install silently in the user’s devices. Even though silent app push is a very effective and hassle free way of installing apps on the user’s devices, it comes with the cost of giving up setting any app restriction on them. How to update Store apps and Enterprise apps on iOS devices using Hexnode MDM? How to push iOS App configuration using XML in Hexnode MDM?